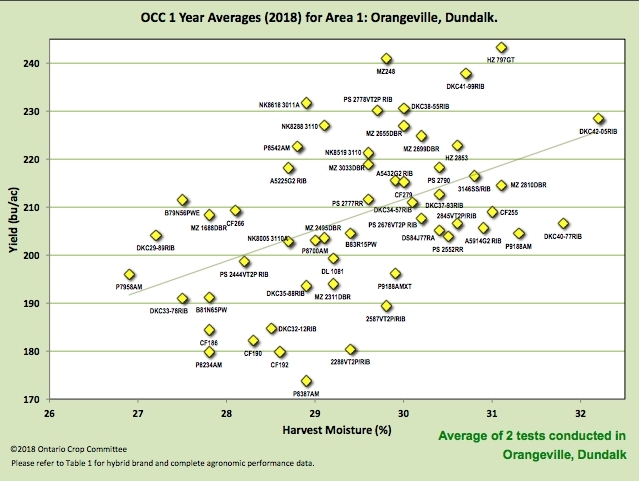 The Ontario Corn Committee (OCC) releases the interim report of the 2018 Ontario Hybrid Corn Performance Trials for all areas except Exeter, Ilderton, Woodstock and Belmont. A graph of yield versus moisture is one of the viewing options for the 2018 hybrid corn performance trials. The delay in results from the southwestern Ontario region could be due to a delayed harvest. As of Nov. 18, the “date harvested” column for Ilderton, Woodstock and Belmont remains listed as “N/A.” The southwestern Ontario region has also been one of the hardest hit with deoxynivalenol (DON), with most of the damage reported in surrounding areas such as Middlesex, Elgin, Huron and Lambton. Despite this, corn yields for 2018 are expected to be above average and these higher yields can offset low-yielding fields impacted by DON. The report notes that OCC trials were more variable than usual this year, so producers analyzing the data should make note of the LSD amount. The LSD amount speaks to how much two hybrids must differ to be considered different. The differences among yield indexes must be greater than the LSD number to be considered significantly different. If the difference is the same or lower than the LSD number, the difference among hybrids is not considered significant. However, emphasis should be put on averages from several locations and years because these provide a more accurate prediction of future performance than do single location results. Hybrid results for the following areas is available online: Orangeville, Dundalk, Elora, Port Hope, Winchester, Wingham, Bainsville, Ottawa, Blyth, Waterloo, Ridgetown, Tilbury and Dresden. Detailed within a document entitled 2018 Trial Locations and General Information are the soil type, planting date and harvest date, which can help producers falling outside of the reporting areas make sense of the results in relation to their own operation and growing conditions. The Ontario Corn Committee is made up of representatives of Agriculture and Agri Food Canada, the Ontario Ministry of Agriculture Food and Rural Affairs, the University of Guelph, the Ontario Soil and Crop Improvement Association, the Grain Farmers of Ontario, the Seed Corn Growers of Ontario and the Canadian Seed Trade Association. Tests are conducted each year by the following cooperating agencies: Ridgetown Campus, University of Guelph, Ridgetown; Plant Agriculture Department, University of Guelph; Kemptville Campus, University of Guelph, Kemptville; and Agriculture and Agri-Food Canada at Ottawa.